At the start of every new season, our editors like to keep an eye out for a special statement piece to add to their repertoire for months to come. It's for this very reason that this hand-embroidered Rachel Comey sweater caught our eye. 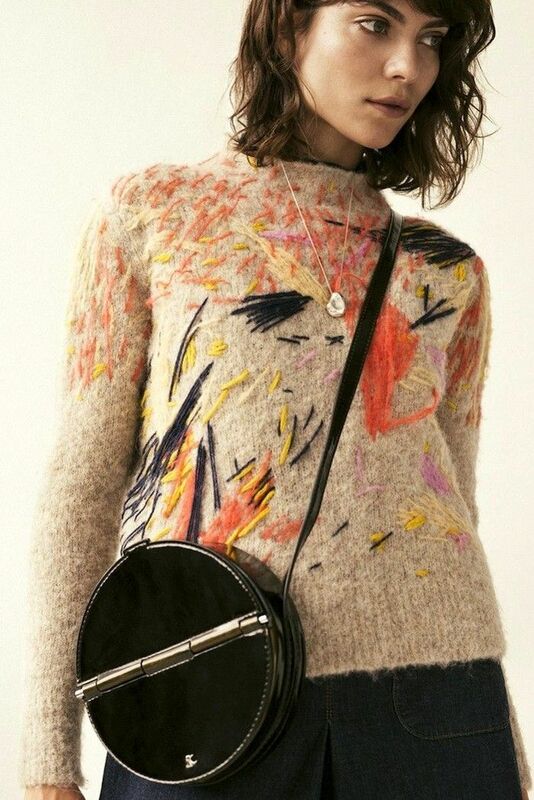 The cozy oatmeal knit features an array of colorful embroidery that transforms it into a wearable form of abstract art. The whimsical sweater can be worn a multitude of ways and is great for brightening up an otherwise simple look. As seen here, it can elevate a dark denim culotte jumpsuit with the help of some fashion-forward glove heels in an autumnal hue. Complete with a simple silver necklace and round crossbody bag, and you've got a stylish outfit that's ready for fall. Scroll through to see the statement sweater and a cool way to style it this season, plus how to get the full look. Abstract hand-embroidered details are what make this a standout sweater. This minimal necklace makes an understated statement. This culotte denim jumpsuit is great on its own or under a cool blazer or knit. This glove shoe makes a great addition to any fall wardrobe. How would you wear this statement sweater? Share in the comments below!